This entry was posted on November 6, 2018 by Magnattack. This month, the Mag-Ram Automatic Self-Cleaning Separator celebrates its 10th year of innovative magnetic separation and advanced foreign metal fragment control. In this article, we take a look at the key features and advantages of the Mag-Ram that have contributed to its high success level in the food processing industry. The Mag-Ram was initially designed to overcome issues experienced with other self-cleaning magnets designs in the market, that consisted of whole magnet rows being pulled through common wiper seals by external air cylinders. These types of systems have historically tended to have consistent maintenance issues. The Mag-Ram effectively overcomes these issues with single Ram (or magnet bar) cleaning, and doing so has provided more sanitary, safer, and very effective magnetic separation for numerous food manufacturers around the globe. Here are some examples of how the Mag-Ram provides superior magnetic separation and overcomes many issues experienced with conventional automatic/self-cleaning magnet designs. 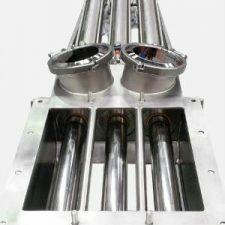 When cleaning multiple bars at one time, residue build-up can cause excess friction and distortion of the cleaning plate, leading to jamming or malfunction during the cleaning cycle. Each separate magnet element within the housing is controlled and activated individually, reducing friction and wear and tear on each magnet. Easy-wearing magnet bars have shorter life spans, high maintenance costs, and increased downtime to repair...especially so in abrasive products such as grain or meat rendering. Dura-Slik™ Surfacing increases abrasion resistance, resulting in longer life span and reduced downtime for repairs. Build-up and blockage on magnet bars causes localized abrasive wear on product impingement areas. This in turn results in ongoing cleaning issues and an uneven magnet surface, consequently resulting in irreparable damage. Each time the magnet bars are retracted for cleaning, an inbuilt incremental mechanism is activated to ensure build-up is dislodged prior to cleaning without dislodging metal collections. This incremental movement serves to minimize material build-up and blockage and equalize abrasive wear so that the cleaning seal remains fully functional. Small diameter bars (e.g. 25mm) have minimal underside retention area and often need larger pole centres than HACCP 0909MAGSEP 1-2010 specifications to achieve required magnet surface strength in order to retain weak magnetics. Larger 2” (51 mm) bars present a larger surface area of product coverage, which gives a greater magnet strength at closer pole centres, increasing collection of fragments. Aside from overcoming the problems of other self-cleaning magnets, the Mag-Ram is a valuable and worthwhile alternative to manual-clean grate magnets. If you're looking for a magnet that will decrease downtime, increase product security, and reduce operator safety risks, then the Mag-Ram could well be the answer! Time consuming to clean. Operator cleaning schedules required. Automatic self-cleaning operation eliminates need for operator cleaning schedules and downtime for cleaning. Risk of metal fragment issues caused by magnets not being cleaned thoroughly by operators. If the magnets are not cleaned regularly and build-up with an excessive amount of metal contamination, there is a greater risk of magnets 'shorting out' and causing recontamination. Continuous self-cleaning operation ensures that a clean magnet Ram/bar is presented to the product flow at all times - therefore reducing recontamination risks and increasing product security. Heavy in weight and often unsafe to clean. Grates in hard to reach locations pose a safety risk where operators are required to balance or climb heights to clean. No need to remove, lift or handle magnets at any time for cleaning. Controls can be installed at a convenient location so operators do not need to visit un-safe areas. The Mag-Ram Self Cleaning Separator is a versatile and robust machine. The system has had success in a wide variety of applications - from incoming to out loading, and dairy powders to pet food. Contact one of our trained and experienced technicians today to find out how you can improve your foreign metal fragment control with the Mag-Ram Self Cleaning Separator. Please fill out the email form on our contact us page and a technician will respond within 24 hours. What a great looking piece of equipment! Thank you for sharing! Cannot wait to learn more. Magnetic Separation is a great industry and is growing all the time!